Community health workers (CHWs), many of them women, work at the vanguard of Seva's efforts to combat blindness in many regions around the world. These workers – some paid, and some volunteer – conduct on-the-ground outreach to identify people in need of eye care and connect them with services, from eyeglasses to medicines to surgery. 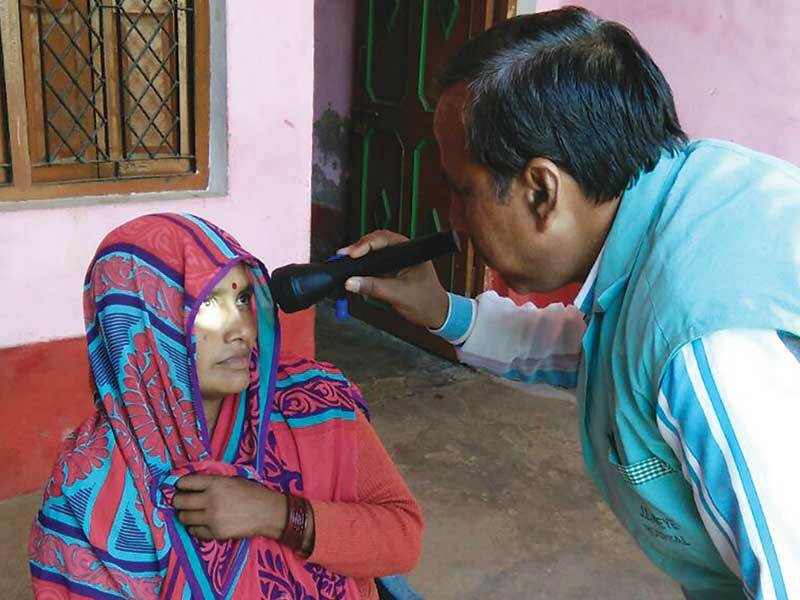 CHWs are key to enabling Seva's in-country partners to reach people who would benefit from eye care services but live in remote areas, are uninformed about available services, or mistakenly believe they could not afford treatment. Often a crucial step in providing eye care is convincing people in need that they will benefit from intervention and services are safe. Such was the case for Radha Devi, a grandmother in northern India's Kanpur area. Devi's community is served by the Govind Nagar Vision Center, part of the network of the LV Prasad Eye Institute, a Seva partner. Devi's vision was deteriorating in both eyes, hindering her from functioning independently. When a CHW was in the process of going door-to-door to develop a baseline of eye care needs in the community, she noticed Devi struggling to help her granddaughter get ready for school. Trained to recognize the signs of cataract, the CHW encouraged Devi to seek further treatment. Although Devi and her family were at first reluctant to address the issue, the CHW was persistent and encouraging. After several visits, she convinced Devi to get an eye exam and, ultimately, a successful cataract surgery. With Devi's vision improved, her life is back on track. It took the perseverance of a trained community member to overcome cultural hurdles and help her get the care she needed. Top: Uday Gozmiar, pictured above left, was a pastor in Siliguri, West Bengal when he was trained through a Seva-supported program to carry out basic pediatric eye screenings in local classrooms. He was surprised to find that his own son, John, had bilateral cataracts which explained why he was having trouble interacting with other kids. Uday took John to get surgery and glasses, and now John is in school and having no difficulties. John is pictured above with his father and mother. Above: Rokehatun and Madhumsri, two field workers from the Alipurduar Hospital in West Bengal, travel door-to-door by bicycle to find villagers in need of eye care and refer them to the hospital for treatment. Above: Community health workers use everyday equipment like flashlights to conduct initial eye exams that identify people who might benefit from additional eye care services.